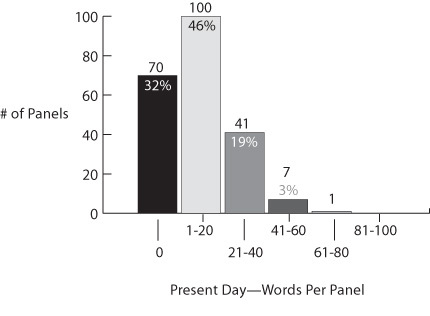 I always find it insightful to stop, take a moment and really look at the trends of comic writing. Not just the trends going on today, but the trends that have come and gone over the years. Below is a collection of just such data. Keep in mind, I’m not a mathematician or statistics guru. 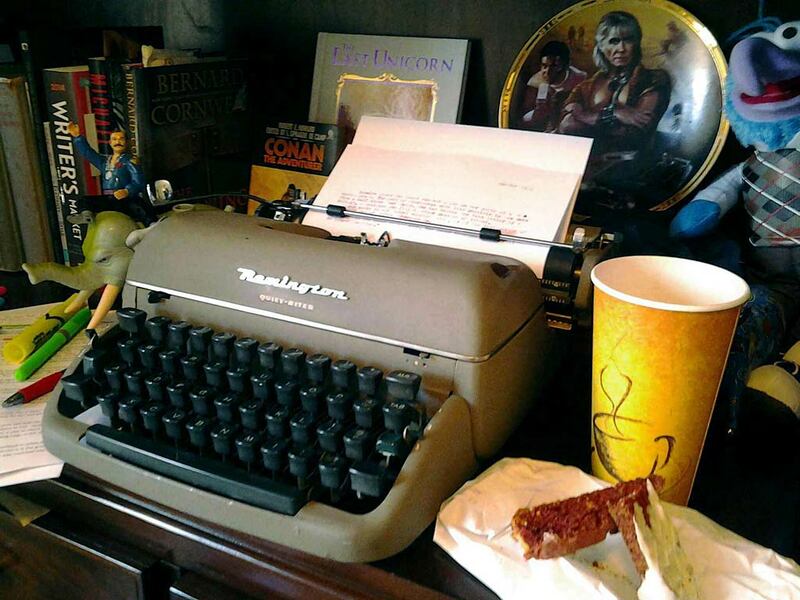 My process for this research included selecting 10 random issues from the specified decades. 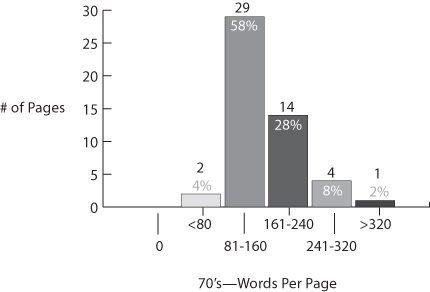 I then jumped to pages 6,11,17,22 and 27—using whatever content those pages contained. If I landed on a full page art or advert, I moved to the next page before or after (randomly picked)—if the book stopped before page 27 (or 22) I opened the comic to a random page and used that page as substitute. A 50 page snapshot probably doesn’t paint the most accurate picture in the world, but I still believe it can tell us something. If you’re like me, you may find the results absolutely fascinating. versus today… This just blew my mind. yeah, that’s 6 pages out of the 50 I flipped to in modern comics containing zero dialogue or narration on them. While I always strive for 3-5 panels a page, 6 does seem to have a special connection balancing art and story in just the right proportion. Seems like it’s been that way since the beginning. 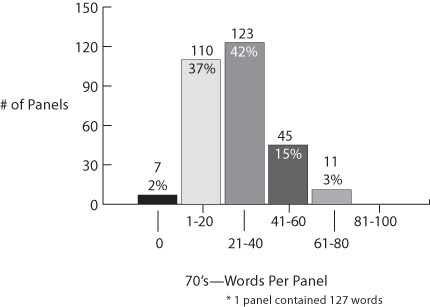 compared to words per panel present day…. 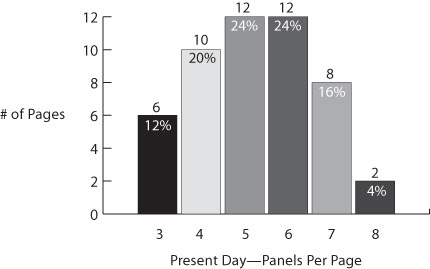 Seems like these days comics are a much more visual medium than days of old. 10 out of 10 comics from the 70’s opened with full page art. versus today, only 2 out of 10 modern books sampled opened with a splash page. 74% of 70’s pages had at least 1 caption on them. 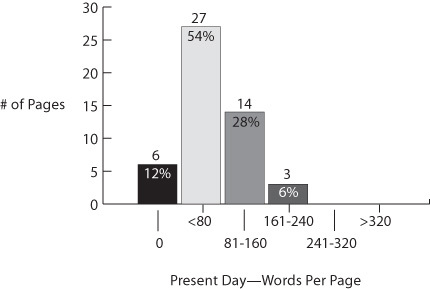 18% (not far off from 1 in 4), had between 5 and 15—that’s a dense usage of captions. 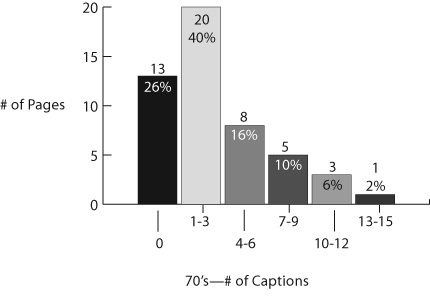 Today it seems as though captions have mostly gone the way of the dodo, with a whopping nearly 60% of pages having no captions at all. 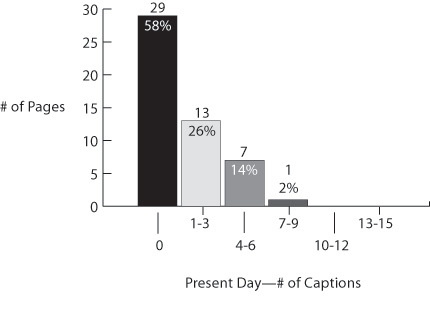 84% of pages had no more than 3 captions, and only 1 page out of 50 sampled had more than 6 captions. 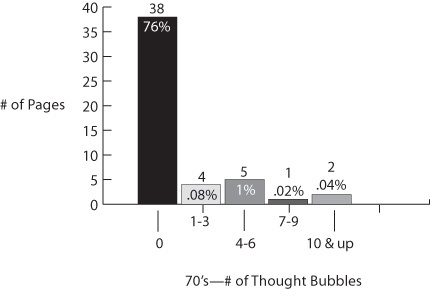 This graph is a bit misleading in that, although the density of thought balloons was not very high, in other words they didn’t appear on every page, they were in fact commonly used. The fact that 3 of the 50 sample pages had over 7 thought bubbles eludes to the fact writers of the time were not afraid to use them. 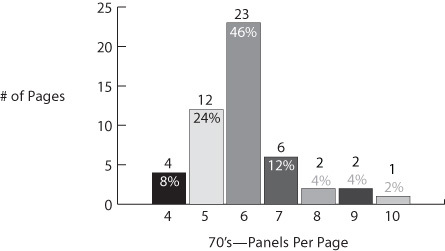 To further illustrate this point, 4 of the 10 issues sampled had 28 – 69 thought bubbles throughout the entire issue. 69 is a lot of thinkin’! In stark contrast, only one thought bubble appeared in all the sample pages of modern books (21st Century Tank Girl). As a sidebar, it’s also interesting to note, that thought bubbles were not exclusive to the heroes. Writers of the time, tended to throw them out for villains and secondary characters however they saw fit. In contrast, every single issue of the 70’s books, did have them. The differences in covers between the 70’s and modern books is drastic to say the least… In fact, I’d go as far to say, from a cover stand point, modern comics look nothing like their former selves. First and foremost, comics from the 70’s across the board almost had a nearly identical layout (varied a bit from publisher to publisher, but even then, shared similar design/layout elements). For Marvel, we recognize this as the Comics Group banner across the top, followed by the title and taglines, the price and issue number boxed on the left, with an art showcase of the main character underneath. In contrast, not one of the modern books shared anything with one another as far as design layout. There is no longer any consistency with the placement or really even the elements themselves. 50% of the 70’s books contained tagline slogans, like “Red Sonja: She-devil with a Sword” or “They Came from Inner Space: Micronauts” In fact, I believe the density of taglines from this era was even higher, a couple of the 70’s books I randomly grabbed were adaptations (Logan’s Run and John Carter) and one was a Marvel Premiere book. So if you threw in 3 other serial hero books, like “the Invincible Ironman”, “the Amazing Spiderman”, or “the Incredible Hulk” I believe more like 80-90% of books from back in the day had taglines. Again, in contrast, not one single issue of the modern comics showcased a title tagline. Zero creator names on all 70’s books. Every modern book showcased creator names. 70% of the 70’s issues showcase art that directly reflected content within the issue. So in Logan’s Run, the main guy has a fight with a bunch of savage kids. The cover shows him being surrounded and attacked by the kids. It’s as if the cover artist selected an actual panel from the book and stuck it on the cover (not the case literally, but in essence). Interesting to note while it’s usually only 1 or 2 bubbles, sometimes, it was quite a few… the Nova cover had 4! While I had an idea most comics of the time used them, I didn’t realize the exact frequency, and the fact that 60% of them actually had 2! Books back then really made a go at selling the experience. In contrast, NOT ONE modern book used interior scenes, dialogue bubbles or call outs. Go figure. I might do an action vs static panel or some sort of content trend assessment, but not totally sure. That said, I think of knowing where the industry’s been and how it landed where it is today, as empowering if not plain useful. You never know when you’ll be tapped (or inspired) to put together a retro book and need to mimic a specific time in comic history. Compiling the data and making these charts takes a hell of a lot of time. Phew! Well there we are. This page took a million hours to put together. Originally, my plan was to do this for the 80’s and 90’s too… but to be honest I’m beat. If I get a second statistics wind, I’ll take a crack at it and send up a flare to let you guys know.